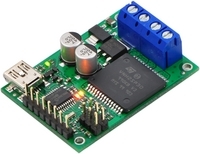 The powerful Jrk 12v12 motor controller is a highly configurable brushed DC motor controller that supports four interface modes: USB, logic-level serial, analog voltage, and hobby radio control (RC). The controller can be used as an open-loop speed control or for closed-loop speed or position control. The continuous output current is approximately 12 A (30 A max) and the operating range of 6–16 V (with transient protection up to 40 V). Analog voltage and tachometer (frequency) feedback options allow quick implementation of closed-loop servo systems, and a free configuration utility (for Windows XP or Vista) allows easy calibration and configuration through the USB port. Simple configuration andcalibrationover USB with free configuration program (Windows XP and Vista compatible). 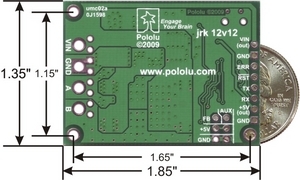 The jrk ships with a 14×1 straight 0.100" male header strip and two 5mm, 2-pin terminal blocks. To provide maximum flexibility, none of these parts are soldered to the board. For the most compact installation, you can solder wires directly to the jrk pads themselves and skip using the included hardware. The included hardware allows you to make less permanent connections. You can break the 14×1 header strip into an 8×1 piece and two 3×1 pieces and solder these strips into the jrk’s I/O pads.